"Jazz legend Jimmy Cobb to receive President's Medal"
SF (San Francisco) State will honor jazz drummer Jimmy Cobb for his mentorship of students and emerging jazz musicians. Cobb will receive the President's Medal at the University's 110th Commencement exercises on May 21. Cobb is an internationally recognized jazz giant and mentor to emerging artists. Each year he teaches and mentors music students and emerging jazz musicians at venues and universities across the U.S. including SF State, Stanford University, The New School for Jazz and Contemporary Music in New York City, the University of Greensboro in North Carolina and the Berklee School of Music in Boston. At SF State, Cobb worked with music faculty to develop the Generations Jazz Project, an ongoing jazz education program that focuses on intergenerational mentoring and the importance of jazz combos. He is also part of the Generations Jazz Band, an all-star ensemble of jazz veterans who serve as ambassadors for the project and as mentors to the program's musicians. The band released "Tough Guys" in 2008. In addition, Cobb has collaborated with faculty on Jazz@Work, a program that has demonstrated the merits of improvisational collaboration to corporate clients including NASA and The Economist magazine. "Mr. Cobb is as generous as he is gifted and takes pleasure in teaching and mentoring young people who share his passion for jazz," said President Robert A. Corrigan. "At San Francisco State we have seen powerful evidence of this commitment." Internationally praised for his musical contributions on more than 400 releases over 60 years, Cobb has collaborated with jazz icons Miles Davis, John Coltrane, Art Blakey, "Cannonball" Adderley, Charlie Parker, Sarah Vaughan, Billie Holiday and many more. Cobb is the drummer on Davis' "Kind of Blue," the best selling jazz album of all time and considered by critics as the finest jazz recording to date. 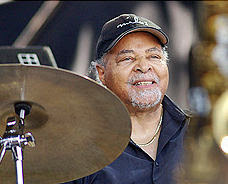 Named a "Jazz Master" by the National Endowment for the Arts in 2008, Cobb continues to play in clubs and jazz festivals worldwide and is in the midst of the Jimmy Cobb & Friends Tour with dates in Europe and across the U.S.
"The President's Medal", the highest honor bestowed by SF State President Robert A. Corrigan, acknowledges those who have made long-lasting, widespread contributions to the University and their community. Past medal awardees include Senator Dianne Feinstein, Former San Francisco Mayor Willie Brown, and founder of Whirlwind Wheelchair Ralf Hotchkiss.